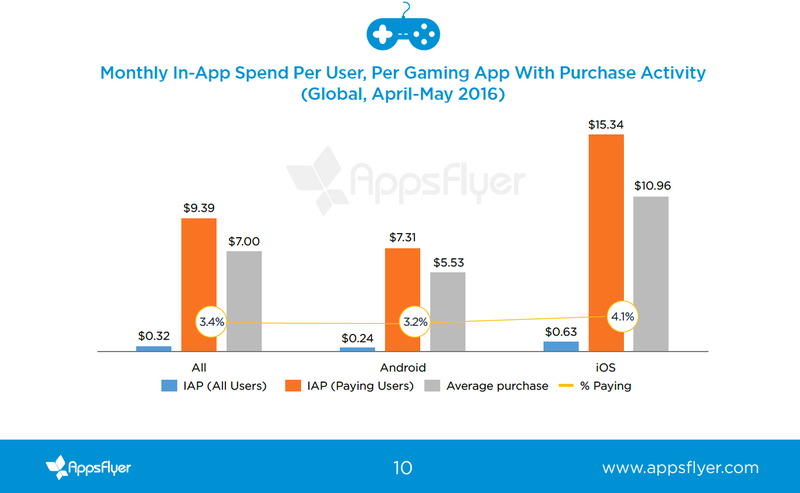 A new report from AppsFlyer that examines the state of in-app spending confirms what many of us already suspected about mobile gaming: it's really, really hard to get any players to spend a dime on your title, but those who do spend often spend big. "Our data showed that only about 3.5% of gamers spend money in-app, but those users are big spenders, spending 30 times more than the average gamer (paying and non-paying) with $9.39 vs. $0.32 a month per gaming app," the report states. Interestingly, as you can see from the chart below, iOS users far outpace their Android counterparts when it comes to in-app spending for games. Not only are there a greater percentage of paying users, but those who are spending on games on Apple's App Store tend to make purchases in the $15 per month range, compared to around $7 on Android. Looking more broadly across all kinds of apps (not just games), AppsFlyer found a similar pattern. The firm saw that by analyzing over 1,000 apps and 100 million users, iOS users spend nearly 2.5 times more than Android users ($1.08 to $0.43 in monthly IAP per user per app). Furthermore, iOS users are about 50% more likely to spend any money than Android users. You can get a copy of the report here if you're looking for more data. Minor quibble: I'm not sure $10 qualifies as a whale. Sure, there's no standard so you can call them whatever you want, but when devs chase 'whales' they're looking at the 0.3% of players who make up 60% of the revenue, each spending hundreds to thousands of dollars a month. FWIW, Tapjoy calls people who spend anything on IAP 'minnows', then ~$20 is 'dolphin', and the 'whales 'are $325 and up. These end up being about the per month, because their lifespan is on average a month - a little more for whales, a little less for dolphins and minnnows. And of course they're still making ad revenue even from the people who don't buy any IAP. Yes, this is all very dehumanizing, but that's the state of the industry. "Our data showed that only about 3.5% of gamers spend money in-app, but those users are big spenders, spending 30 times more than the average gamer (paying and non-paying) with $9.39 vs. $0.32 a month per gaming app"
Er... So they're saying the average spend of all spenders is about 30 times higher than the average spend of all players (including both spenders and non-spenders)? Of course it is, only about 1 in 30 players are spenders. As far as I can see there's nothing actually in this article about whales or comparing the amount spent by different types of user. They're just saying that people who spend spend more than people who don't spend. I went through the full report to see if I was missing something but it seems these numbers are just meaningless averages. Of course paying users spend more than than non-paying users. The difference in averages is just a reflection of that. Unless there is something I'm not seeing. The regional comparison of share of paying users and average purchase numbers are still interesting, though.